From Bram Stoker Award-nominated publisher, Crystal Lake Publishing, and the editing duo who brought you the best-selling and critically acclaimed small-town Lovecraftian horror anthology Shadows Over Main Street, comes Gutted: Beautiful Horror Stories—a disturbing journey into the beauty that rests inside the very heart of darkness. Crystal Lake has yet to disappoint me; they consistently put out work of the highest quality. I am the luckiest and most grateful reviewer for having had the opportunity to read this collection — and I will continue to jockey to be first in line for any future publications. 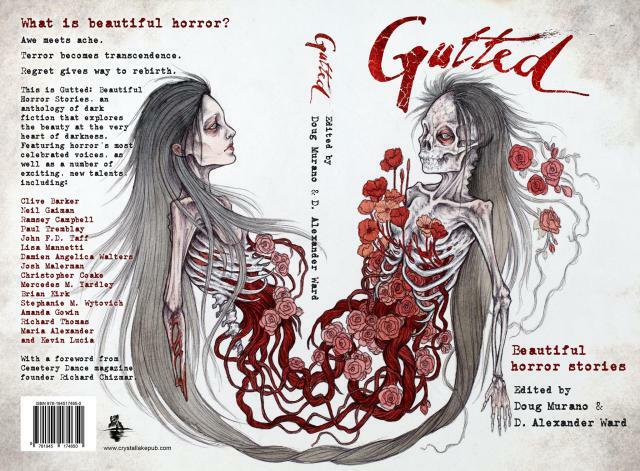 Gutted is truth in advertising: these are truly beautiful horror stories. The anthology includes some of the genre’s biggest names: Clive Barker, Ramsey Campbell and Neil Gaiman. The interior artwork, by Luke Spooner, is the perfect hors d’oeuvre for each story. The inky images are captivating and I probably spent nearly the same amount of time pondering them as I did the writing. Gutted is a must-read, must-own for horror fans. Glorious and gorgeous, it will leave you feeling both sated and wanting more.